What is the recommended workflow for creating reports? The goal of ‘report builder’ is to streamline management reporting workflows. When creating a report, the recommended workflow is to start by creating a ‘draft’ report. While in ‘draft’, editors can collaborate together to craft the perfect report. When a report is ready to share with clients or viewers, then the report can be published. 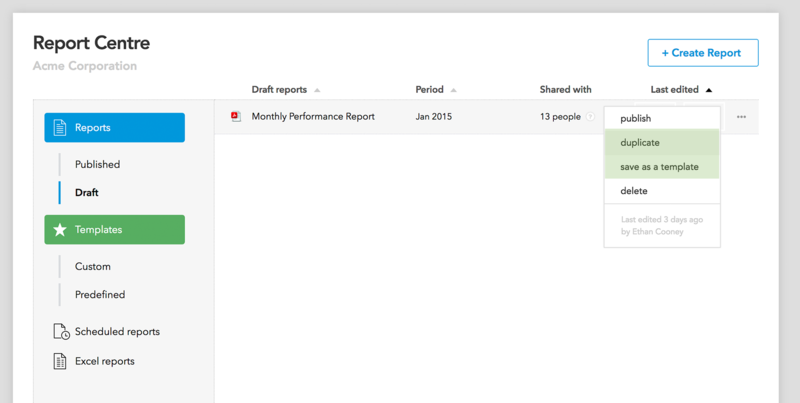 Tip: When creating a report for the current period, start by duplicating a recent report (ie. last month’s report), and then make changes as required. At any time, when the design of a report is completed, this report can be optionally saved for use as a template. Template can then be scheduled to automatically generate reports at specified time periods. Templates are also an efficient workflow for creating reports for groups of clients. For example, an advisor may design a performance report tailored for clients which operate in a specific industry vertical or sector (ie. retailers). This template can then be used to create reports for these clients.